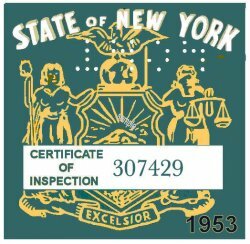 1953 New York INSPECTION Sticker - $20.00 : Bob Hoyts Classic Inspection Stickers, Add a Final Touch to your Restoration! This 1953 New York Inspection sticker we believe to be the first year year New York issued statewide Inspection stickers. Previously Safety Check stickers were used at different locatios around the state. This sticker is identical to the 1954 and is the same color. It was issued very late in the year which leads us to believe it was the first one. This one has been restored and reproduced precisely identical front and back to the original. This sticker has our patented "Peel and Stick" format which allows the sticker to be fastened to the inside of your windshield.